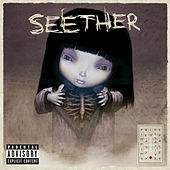 While many of their post-grunge peers have slid into power-ballad syrup or have cut their angst with pop-metal sugar, Seether remains defiantly old school, with a sound that is more Seattle than Hollywood. Finding Beauty in Negative Spaces, the South African group's fourth full-length, is angry, dark and restless. Possessing a knack for mosh-pit anthems, frontman Shaun Morgan obsesses over the Ouroboros that is trust and betrayal for most of the album. On the relentless riff-rager "Fake It," his indignancy comes to a boil: "You're such a f*cking hypocrite," he howls over and over.